Kata joined CBN Asia in March 2006, assuming the role of Vice President for Production and Programming, as well as Executive Producer of the daily The 700 Club Asia. Following a 15-year career in broadcasting with ABS- CBN Channel 2, Kata has cut out her niche as a Christian broadcaster-televangelist in the leading Christian Networks- CBN Asia and Zoe TV. Kata envisions to create and distribute cutting-edge and values-laden programs that promote the truth of the Gospel of Jesus Christ for the transformation of the nation and the saturation of the nations. 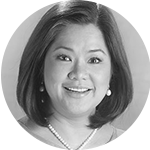 She has spearheaded the organization of the Media Pillar of the Philippines, composed of Christian media practitioners, which aims to have godly influence in society and effect postive change for the nation by modeling righteousness, educating the audiences and setting the standard of the industry. Kata is co-founding board member of the Kol Adonai Foundation: The Voice of the Lord Ministry which has established a Prayer Tent (Worship Center) on Mount Olives in Jerusalem. She recently hosted the Jerusalem Summit Asia 5 in Jerusalem, Israel which brought together Asian church and government leaders with Israeli parliamentarians, academics, and the media. The conference fostered greater understanding and cooperation for influential Christians to align with God’s biblical plan for Israel, the Middle East and the nations. Kata is a graduate of Bachelor of Arts in Broadcast Communication from the University of the Philippines and a two-year Ministry Leadership course from Every Nation Leadership Institute. She is a member of the Victory Christian Fellowship.